I love getting bok choy at the market. The problem is I always seem to let it go bad before using it. It ends up in my compost pile so it's not a complete waste, but this time I was determined to make something with it. I cooked up some quinoa and then added in sauteed onions and walnuts to create a stuffing that turned this veggie into something almost hearty enough to serve as a light main course. Prepare quinoa according to package directions (be sure to rinse thoroughly if not pre-rinsed). Put water in steamer and bring to a boil. Heat oil in a small pan and saute diced onion until translucent. Add walnuts and warm through. Add quinoa to onion and walnut mixture (if you're not making the soy reduction you'll want to salt the stuffing at this point, but if making the reduction there will be plenty of sodium in that). 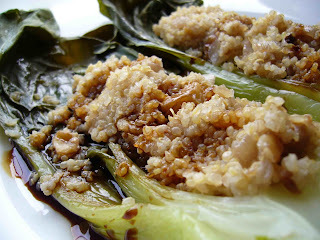 Split the bok choy in half lengthwise and remove a few of the inner leaves to make room for the stuffing. Put a quarter of the stuffing in the center of each bok choy half and add to steamer. I have to steam mine in two batches as only two will fit at a time. Steam for 10 minutes and remove. While bok choy is steaming add soy sauce, lemon juice and honey to a small pot. Bring to a simmer and reduce by about half, then cool. Place each half on a plate and drizzle with reduction. Enjoy! Baby bok choy and quinoa...Now that is one combo I will have to try...looks and sounds great...not to mention nutritionally a winner! I love quinoa and I am always looking for different ways to cook with it. I'll definitely try this one! I have the same problem with bok choy in not using it fast enough. But, this sounds like a fantastic idea! Thanks.